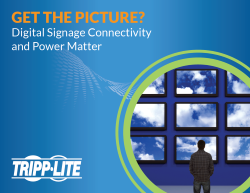 Download this paper to learn how you can be confident when maximizing your digital signage system with Tripp Lite’s broad selection of highly cost-efficient, expansion-friendly connectivity, protection and power solutions. Digital signage is everywhere these days. In fact, 78 per cent of businesses now employ digital signage. Systems can range from single displays to multi-screen networks delivering multiple messages, but no matter how simple or fancy your front-end screens and back-end content sources, your solution needs to be well-connected and well protected. Ultimately, your system’s performance depends on the quality and reliability of your signal distribution and power solutions. Digital signage offers unparalleled opportunities for you to communicate with, advertise to, educate and inform the people you want to reach most. But no matter how clever, dynamic, up-to-the minute or brand-building your content is, it’s only as effective as the infrastructure that delivers and displays it.